Twin Oaks Community is an egalitarian, income-sharing community of nearly 100 adults on 450 acres in Louisa County in Central Virginia. Their seeds crew ranges from 6 to 8 people. Edmund Frost was the crew manager for years, but has left Twin Oaks and started Mimosa Community nearby, while continuing to grow seeds. Now the Twin Oaks seed crew is managed by Chris Prime. The community also runs a dairy that meets all its needs for milk, cheese, yogurt, and butter, raises cattle, has an orchard, and grows most of its own vegetables in gardens that are separate from the seeds gardens. Twin Oaks Community's other major sources of income are making and selling hammocks, making and selling tofu, and running Southern Exposure's Seed Racks program for retail stores that resell our seeds. 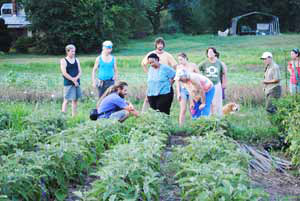 Growing seeds for Southern Exposure fits well into into this system, adding a reliable new income source to the farm. 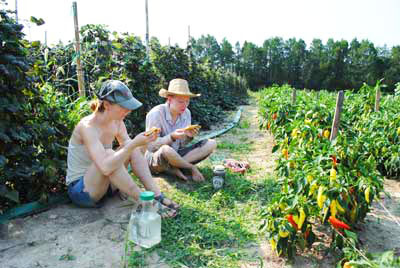 Twin Oaks Community Seeds has been growing certified organic seed crops since 2008, and quickly became Southern Exposure's largest grower in terms of varieties grown. 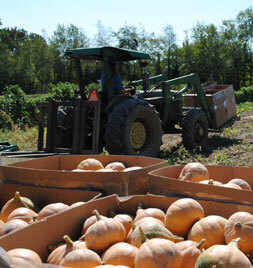 In 2010, Twin Oaks grew sixty varieties of seeds, most of them for Southern Exposure. Four separate gardens totaling nearly four acres allow for the necessary isolation distances to grow this many varieties. Twin Oaks's seed crops include cotton, southern peas, okra, perennial onions, peanuts, tomatoes, peppers, winter and summer squash, eggplant, corn, cucumbers, bush and pole beans, watermelon, muskmelon, cantaloupe, roselle, zinnias, 4 o'clocks and tithonia. Some of the crew's favorite varieties have been Edisto 47 muskmelon and Strawberry watermelon. Granny Cantrell's tomato performed outstandingly in our somewhat drought-stressed gardens in 2011, and was incredibly flavorful. They like Seminole pumpkin (very vigorous, productive and tasty), Corona pepper (good flavor, good keeper), Aji Dulce peppers (especially dried or as pickled peppers), yellow potato onions, Yellow Moon and Stars watermelon (they've been selecting for sweetness), Suyo Long cucumber, and Brandywine OTV (definitely their favorite of the Brandywines). 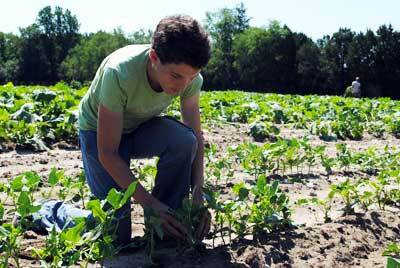 Twin Oaks's seed gardens benefit from added fertility from the Community's tofu business. 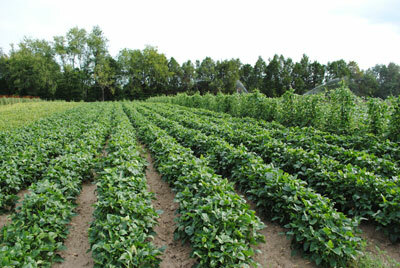 Tofu whey water and okara (the starchy part of the beans) are both excellent nutrient sources for gardens and hayfields. 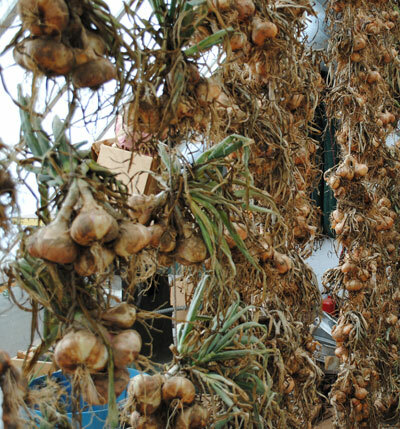 They're excited to be able to use this local resource to support their gardens. 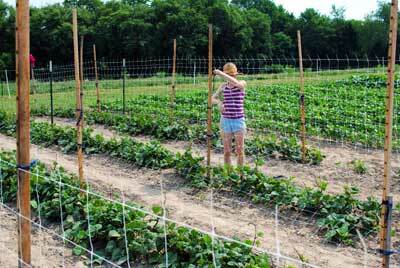 The seeds crew at Twin Oaks tries to maximize the food-value of their seed crops. Rather than quickly processing melon and squash for seeds in the field, they save the flesh of these fruits under clean conditions, and frequently donate to local food banks and other organizations. The seeds garden at Twin Oaks includes extensive cover cropping with annual rye, sorghum-sudan, buckwheat, vetch, Austrian winter peas and clover. They carefully monitor their soil conditions to avoid nutrient run-off and tailor their land management precisely to the needs of their soils. They are also doing some promising experiments with no-till rye systems.